The election monitoring body – Campaign for Free and Fair Elections (CaFFE) has written to the Elections Commissioner expressing grave concern over the use of vehicles for election campaign purposes, that do not bear garage numbers or vehicle registration numbers, which has created a climate of terror within particularly the Moneragala town. The organisation had written three letters to the relevant authorities urging them to shed their immediate attention on these incidents of gross violations of election laws. “This is not only a gross violation of election laws but also a violation of the regulations of the Vehicle Registration act. But the Police don’t seem to stop these vehicles and probe them. It is baffling as to why or how even police officials who have been stationed with high-powered motorcycles to probe into violations of vehicle traffic have not noticed the presence of these vehicles,” CaFFE notes. He has furthermore pointed out that even following 21 attacks on opposition party offices within 72 hours, if the Police remains inactive on removing these illegal vehicles from the areas, it only indicates rampant lawlessness and collapse of law and order in the Moneragala area. 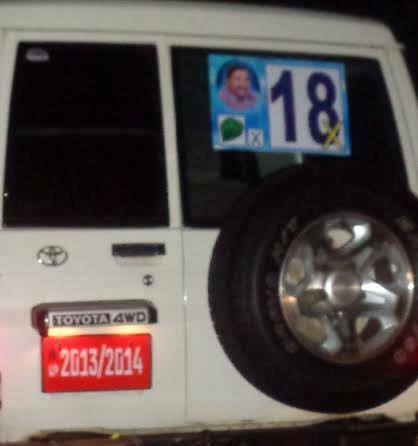 Meanwhile, CaFFE has also noted the owned by UPFA candidate Sendhil Thondaman parked in the Bandarawela town without a vehicle registration number. Presently a total of 114 incidents of election law violations have been reported to CaFFE and 84 of them have been from Moneragala district and 24 from Badulla.